Yesterday morning, hundreds of policemen arrived at the village of Umm al-Hiran before dawn, in order to demolish six structures, after attempts to reach an agreement shattered over the night. Police stormed into the village, and policemen ran directly to besiege the six condemned structures and climbed onto their roofs with weapons drawn. At that time, Ya’aqub Abu Alqian, whose houses were supposed to be demolished, took his personal belongings, important documents, and some money, and entered his car. According to videos released from these moments, policemen started shooting live ammunition at him while he was driving slowly near his home, and eyewitnesses said that he was dead or at least lost control over his car before it rolled down the hill and hit a policeman, killing him on the spot. Abu Alqian’s car was shot with dozens of bullets. Israeli Police did not wait for a proper investigation and early in the morning released dozens of statements to the press stating that it was “a terror attack against policemen”, that Abu Alqian “was a terrorist affiliated with the Islamic Movement”, and even that “he might have had connections to ISIS that the Shin Bet is now looking into”. 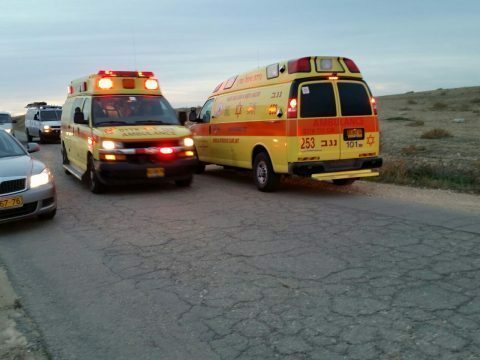 Israeli media quickly published all these headlines without checking what happened on the ground, and the Israeli public woke up to this news, about a Bedouin “terrorist” who killed a policeman during a house demolition operation in the village of Umm al-Hiran. Abu Alqian was 47, a teacher in mathematics and sciences at the as-Salam school in Hura, and in his spare time tended to his sheep in the village. The day before the incident, Abu Alqian visited his mother’s home in Hura. He was sitting with his brother Ahmad and his mother Sarah, telling them that if police would come to demolish his house, he would get into the car and come to his mother’s home. Videos and eyewitnesses’ testimonies released later that day exposed that earlier police statements had no grounds, including an aerial video by police showing that Abu Alqian was shot before the incident. Yet, the Israeli public already learned from the media and from inciting statements by government ministers and police officials that it was “a terror attack”, and any new findings did not receive as much exposure. After the incident, police stayed in the village and within a couple of hours started demolishing the structures, including Abu Alqian’s home and animal pen, confiscating his entire herd of sheep. 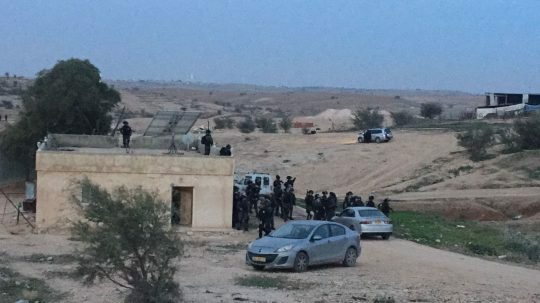 This is the second demolition in Umm al-Hiran within a couple of months, after the Bedouin Authority and the police managed to compel another resident to destroy his entire compound of about 10 structures on his own and move to Hura. The village of Umm al-Hiran is being demolished in order to clear the way for the new Jewish town of Hiran to be built on its lands. Its residents were relocated from their ancestral lands and were ordered by the military regime to build their village in its current location in the 1950s. After years of litigation in attempts to save their village, the Israeli High Court ruled that the village could be destroyed. Months of negotiations with state authorities aiming to reach an agreed solution ended yesterday with the horrible death of two men, and the demolition of six structures, leaving dozens of people homeless. The Negev Coexistence Forum calls on the government to stop the incitement against the Bedouin community, and to establish an independent investigation committee for yesterday’s events. NCF will keep supporting the family and the village in their ongoing struggle for justice.